Over his shoulder he carries a weapon so large it’s normally mounted to a vehicle before it can be fired. On his face he wears a mask to conceal his identity — but he is unmistakable. People know him as “The Bulldozer of Fallujah” and he’s the world’s most feared terror group’s biggest weapon. Until this week, the unnamed member of Islamic State tried to blend into the background. His exploits are now front and centre after his treatment of a 14-year-old boy named Omar. 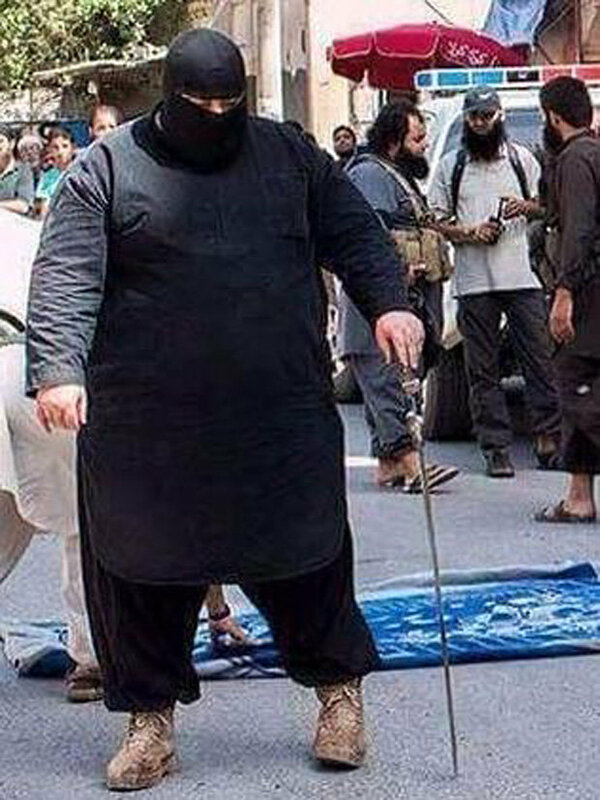 The new member of the terror group’s feared “chopping committee” is no jolly fat man. The mammoth Iraqi – who was first photographed toting a 52kg anti-aircraft gun meant for TANKS – has appeared slicing up children in a sick new series of videos. He can be seen jumping – raising his humungous bulk off the ground – to get his full weight behind his deadly sabre. Images have emerged of The Bulldozer surrounded by headless corpses after a flurry of beheadings. Omar was in Syria fighting with the Free Syrian Army when things went terribly wrong.He was running ammunition and food to fighters made up of defected Syrian Armed Forces officers and everyday civilians. On Omar’s phone are pictures of The Bulldozer. There are also pictures of his own cut-off hand and foot. In an interview with Channel 4, the teen, whose name has been changed, told a story that haunts him and has left him so devastated he has “given up on life”. He said IS made a show out of torturing him. The show would turn bloody and change his life forever when The Bulldozer moved in. “They gathered the people, they tied down my hand and my leg, they put my hand on a wooden block and cut it off with a butcher’s knife,” Omar told Channel 4. Months later, hobbling around his home with bandages covering the ends of his limbs, Omar says he has lost all hope. The 20st BEAST is known as “The Bulldozer of Fallujah” – and he is fast gaining as fearsome a reputation as Jihadi John. Like the infamous Brit, The Bulldozer beheads his quivering victims on camera in cold blood. And like the barbaric “Beatle” – real name Mohammed Emwazi – The Bulldozer hides his identity behind a mask. The good guys have their own big names, none bigger than the “Father of the Archangel of Death”. The former Iraqi soldier’s real name is Abu Azrael. Dressed in black and armed with a machine gun, an axe and a sword, he presents an imposing figure. He even has his own Facebook page with more than 340,000 likes. On the page, Azrael, also known as “Iraq’s Rambo”, is pictured smiling with other soldiers, lifting weights in a gym and shouldering a rocket launcher. He is believed to have killed a number of Islamic State fighters in dozens of locations but also had experience fighting against US forces during the Iraq War. It’s unlikely The Bulldozer and The Father of the Archangel of Death will ever meet, but it hasn’t stopped the internet from wishing they would. 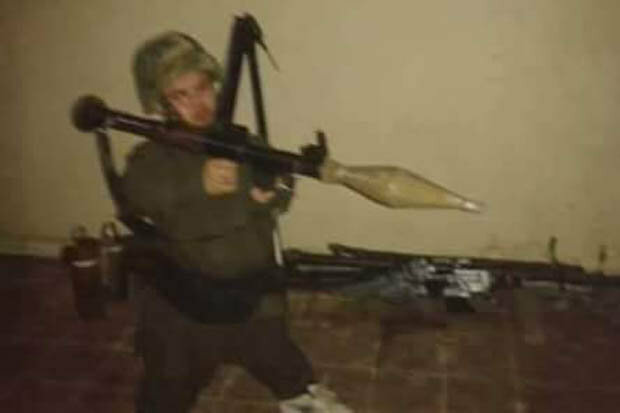 YOU’VE met the biggest extremist in Syria, now meet the smallest – the mini-militant dubbed Jihadi “Little” John. Pics of the diddy diehard and his arsenal of terror, including AK47s and rocket launchers, have been doing the rounds on social media. It comes after Islamic State’s 20st executioner ‘The Bulldozer’ was revealed to the world beheading victims in cold blood for the camera. 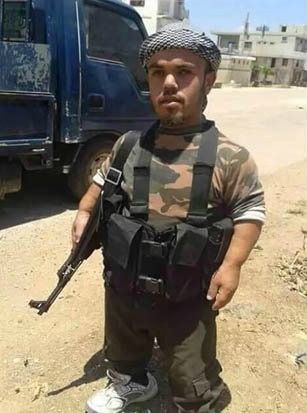 Now news has emerged that terror warlords have another fearsome weapon amidst their ranks – a dwarf fighter. The pint-sized extremist earned his nickname from Jihadi John, the evil Brit killer behind a spate of gruesome beheadings. The wee warmonger has also been branded “Abu Ahmad Al-Chihuahua” by Beirut-based journalist Leith Abou Fadel, editor-in-chef of Al–Masdar news. He speculated that Jihadi “Little” John was fighting with the al-Nusra front, al-Qaida’s pals in Syria – and warned “he bites”. “I tried to find out more about him but the information was limited,” Abou Fadel said. But some say he fights under an ISIS flag. 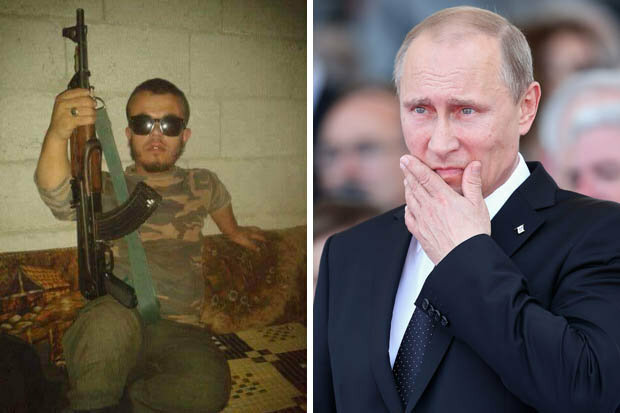 The three-foot fanatic is being lionised in the propaganda war against Russian hardman Vladimir Putin, who has been smashing Islamist targets in the country with a series of airstrikes. Despite Social media and certain Newspapers making light of this story it must always be remember that ISIS and other Islamic Extremist are no laughing matter and are a stain on humanity and need to be eradicated at all costs. The world has seen enough of their twisted ideology and would be a much richer place without them. If reports are true and this vile , evil human has been captured then this another in a long line of high profile setbacks for Islamic State and their deluded followers. The crimes of this monster are beyond evil and he is drenched in the blood of the innocent and NEEDS to pay for his crimes against humanity and membership of the merchants of death and destruction which is the Islamic State. 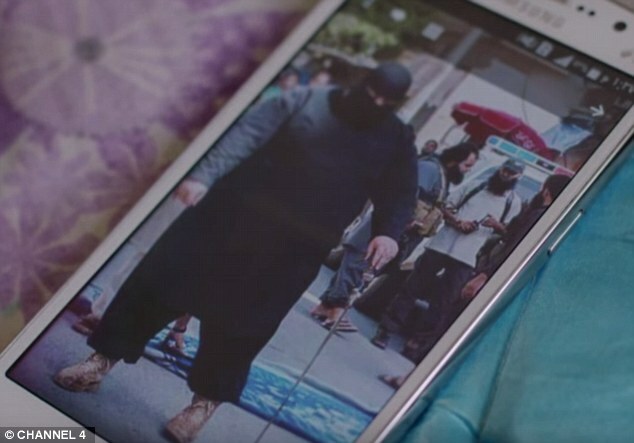 The obese extremist, a member of the terror group’s so-called Chopping Committee, is seen lying half-naked in the back of a truck with his hands tied behind his back.